Our Transportation Department is responsible for the safe and efficient transport of students and district employees. 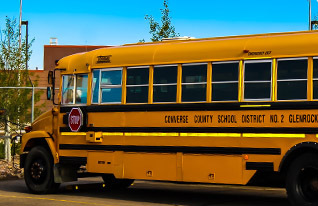 Our skilled bus drivers are trained and certified according the strict regulations of the state of Wyoming. We ask that you help your child learn the safety rules so that we can maintain our outstanding safety record. Please let us know if you have any questions or concerns. Our district uses Zonar Z-Pass cards for every bus rider in the district to track the students when they scan on and off the bus. Student transportation is a privilege and not a right, carrying with it certain student responsibilities. As such, using the bus pass is a requirement. We utilize Routefinder Pro through Transfinder, a web-based routing system, and InfoFinder le for Field Trip/Vehicle Requests (in building use only). Leave windows closed unless you have permission to open it. If you open it, close it upon leaving. Keep arms and head inside the bus, and do not throw objects from the windows. Sit in your assigned seat. Never walk inside a moving bus. Outside of ordinary conversation, observe classroom conduct and use an “inside voice” on the bus. Keep aisles free and passable. Keep hands off safety devices, any mechanical part, or door closers. No littering, spitting, writing on the bus, or vandalizing the bus in any way. No profanity, swearing, abuse or bullying of others, shouting, or horseplay. Obey the driver and be courteous to other students and to the driver.